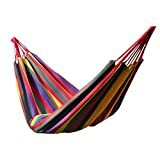 Comfortable Hammock: This camping hammock is made of high density breathable cotton and fabric; Which is super soft and comfortable, and especially safe for your baby. The material has excellent color fastness, so that it will stay strong and clean for years to come. Friends,don’t miss chance to own this wonderful outdoor or indoor hammock bed. Quick Set Up: Accommodates 2 adults, up to 450 lbs. Carrying Case included, Easy installation, no tools neccessary. Mulfuction Hammock: Ideal for camping, backpacking, dormitory hammock chair, outdoor hammock bed, picnic mat, kids crawl mat, outdoor relax hammock bed, and it is a perfect alternative to a tent. You can leave it in your backyard; bring it to your cottage; hang it on the porch; take it camping or use it anywhere indoor / outdoor. You decide it. Lighweight: Only weighs 1.6 pounds making it easily portable with included carrying case. Reliable Customer Service: Stoga wants provides our customers a good shopping experience. If you have any problems, please simply contact our reliable service team. You will receive an unmatched personal assistant. 1. Material: High-density Fine fabric Canvas. 2. Easy fixing, just fix the hammock with 2 binding strings and tie the strings to trees or poles. 3. Easy to carry and pack. 4. Every string is weaved together with it’s neighbor one so that the pressure one string bears could be passed on to others quickly. 5. The rope joint is specially weaved according to physics rules in order every string stand the same weight and the hammock is strong enough. 6. Adopt a special extra heavy canvas fabric as material, crease proof, pleasant to looking and feels comfortable. 7. Looking nice with swing press edge and no rough selvedge. 8. Evokes your warm memory of childhood. 9. Suitable for outdoor sports like camping, climbing, travelling, hiking, picnic, backyards, even indoor use. 10. Size: 190 x 150cm/ 78.74x 59.05 inches(Approx), total 250cm. 11. Stand weight: 200Kgs (Approx).